Since 2012 VA Pittsburgh Fisher House has been providing a "home away from home" for the families of Veterans and active duty military who are hospitalized. We are located on the VA Pittsburgh Healthcare System's Oakland campus. Our home, with its 10 suites, allows families to be near their loved one while enjoying a place of peace and respite for themselves. Families stay for free, lifting their financial burden and allowing them to focus on their patient. We in Pittsburgh already know that Alejandro Villanueva of the Pittsburgh Steelers is awesome on the field, but you may not know just how strong his support is for his fellow Veterans. He visits Veterans regularly here at VA Pittsburgh (under the radar, which is how he prefers it) and recently he just dropped by the Pittsburgh Fisher House to write a $15,000 check to support our Veterans' families here at the house! And, due to a friendly wager from the Army Navy game- Joseph Cardona of the New England Patriots gave Pittsburgh Fisher House an additional $1,000. Thank you both so much for your support and generosity!!! 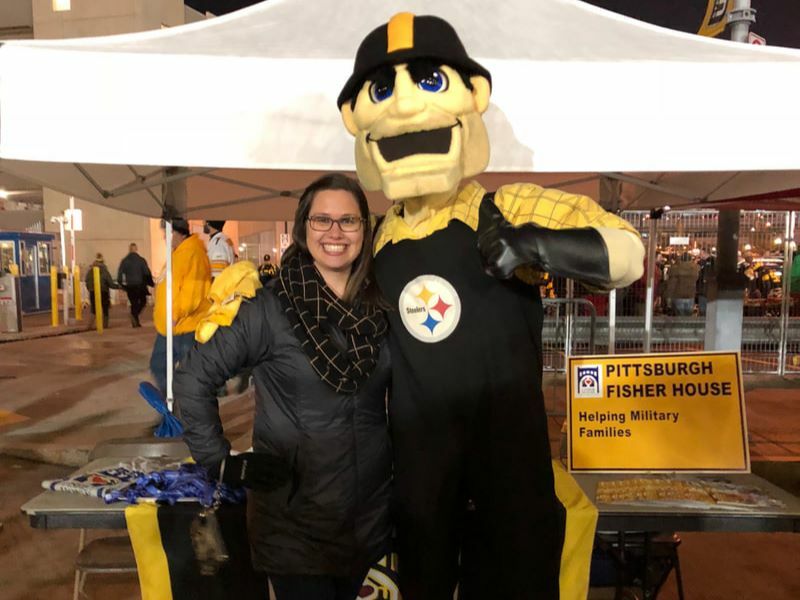 THANKS to the Pittsburgh Steelers for inviting Friends of the Pittsburgh Fisher House to participate in the Salute to Service event on Art Rooney Avenue before the Steelers WIN against the Panthers on Thursday November 12.